so plain and simple but so beautiful. 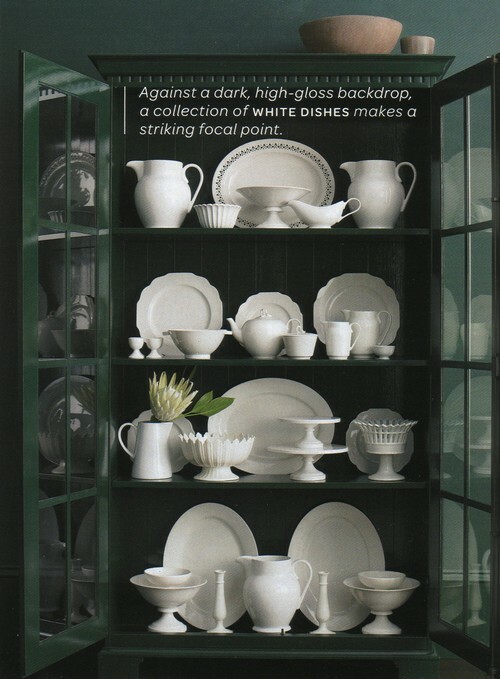 I have had white dinner dishes for years that we use everyday. so easy to mix and match. but I think a couple more would be fantastic. of which I found on Pinterest. With the green pears... delicious! Really loving the yellow cupboards with the white here~ so charming. Absolutely love pitchers and tureens. 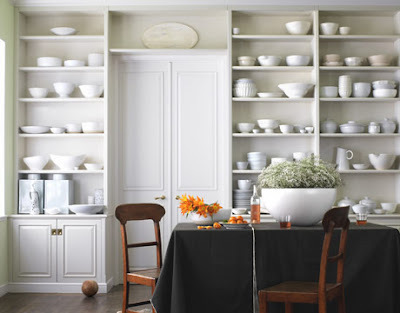 Probably a favorite look is white dishes against a white or light background. I just adore the simplicity of the combination. 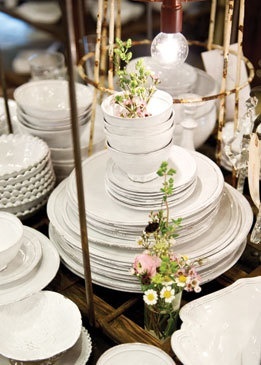 with stacks of white plates, dainty white coffee cups and serving bowls. Atop that chippy cupboard are several white pitchers as well. Sale runs through Thursday at midnight. little cottage~ not ready to share too much yet but it's coming along. 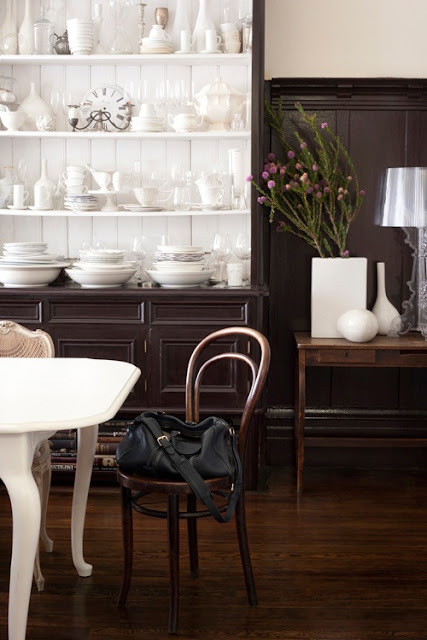 Yes, I am collecting lots of thrifty white treasures to use out there too! Of course I love all these, too and am always looking for more pieces. Beautiful as always...love the white. Lovely pictures...yours stand out from the rest though. Oooh. Nice pictures. I also love white dishes, and red transferware as well. We've used our white ones since we got married (21 years ago) and I've never gotten tired of them. They mix so nicely with every color. Thanks for the inspiration! I'm crazy about white, too. Don't know what I would do without my collection of white milkglass compotes that I use for everything...serving side dishes, flowers, fruit, pretty hand soaps, christmas ornaments...the list goes on! Happy Tuesday to you too! I only have white dishes too. I don't like the table to be busy...food does look delicious on white plates. Great inspiration pictures, Courtney! I'm a sucker for a white tureen ~ detailed or plain. I just wish I had more room for white pieces. I've decided, though, that if I did find tureens, I will make a display of them above my kitchen cabinets. Yup, I have been doing that too! Homegoods can be a great source. I cant recall a time where I went there and didnt want to take some white serving piece home with me. The best thing with that store is you never know what youre going to find! Happy hunting. I'm always trying to add to my collection too..I'm now at the wonderful picky point! As soon as I walk in the door, I head for the dishes at Home Goods, TJMax, or Pier One. Same thing at the thrift shops, and antique shops. I'm assured of finding at least one white piece to bring home with me. Your photos are wonderful! and full of inspiration! I, too, adore white dishes! Yours are especially charming! Thanks for the inspiration and the Art source discount! White is so peaceful. I loved scrolling through your pictures. Thanks for sharing. I absolutely love the look of all white dishes. So classic and always beautiful. You photos are so awesome and inspiring. The more white dishes I come across the more I want! Beautiful kitchen you have, and beautiful inspiration photos that inspire. 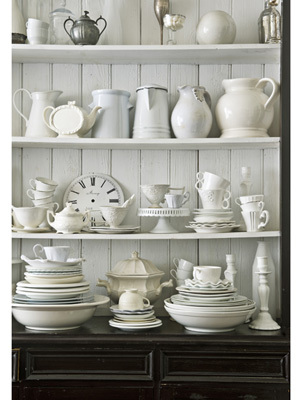 Also love white wares as well as ironstone. Hello Courtney, Again a beautiful post! Wish you could post twice a day! I always look so forward to what you have done! Can't wait to see your tiny cottage! I had a tiny cottage once - all for myself! And then we sold the place... sigh! Oh well, so where did you get those pretty white dishes from that look so dainty? Will you share the secret? 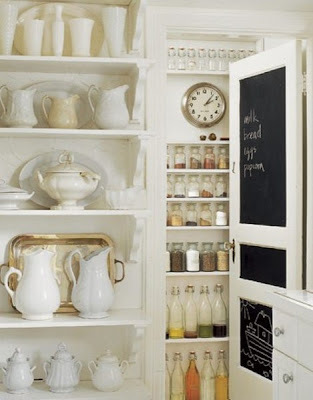 Ok, I'm going right home and taking every single thing out of my hutch and filling it with white dishes. I love them too, and i'm always watching the thrift shop and Marshalls and TJ Maxx for more. I love the old Homer Laughlin platters... and i found the cutest little fat oval butter dishes a while back... Beautiful examples of white ware... You are always such a complete inspiration! Girl, you are SO not alone! I share your obsession, too! I got the white Privet House dishes at Target and I LOVE them! Such a unique edge to them! I can't get enough white dishes either. I love all of this. And I love you cabinets in the first pic. I also share your obsession for white dishes. I collected several sets when I lived in Germany. 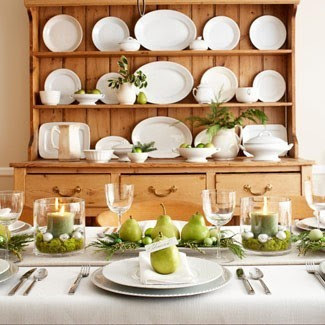 They are so versatile and create a calming and elegant setting. Your photos are so inspiring. Thanks! The white dishes are very nice... I must say that the Green painted furniture is so pretty. I love green. 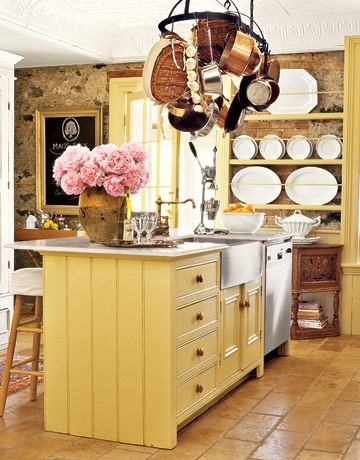 But that YELLOW Kitchen... charming for sure! I have yellow in my kitchen...but that is beautiful! De gros bisous et si je ne trouve pas un petit moment avant mon départ pour vous faire un coucou, sachez que je serai de retour à la mi-septembre. love your photos, Courtney. Am new to loving white dishes, now am crazy for them. Fab examples! adore your sheep print! I love white dishes as well and have used some everyday for years. I got mine at a restaurant supply company and they are very strong dishes and have a nice scalloped edge. 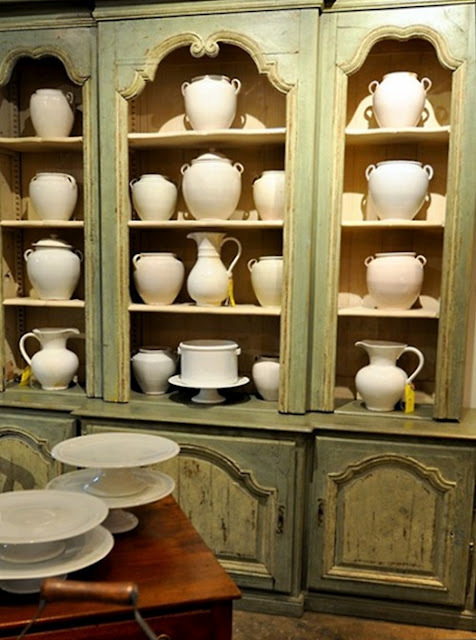 I would love to collect some of the white confit pots as well as some white ironstone pitchers for display. Love all the photos you posted. I love the line Target came out with! Mine are an off white from Pottery Barn - love them but love the stark white ones also! Oh so many collections. 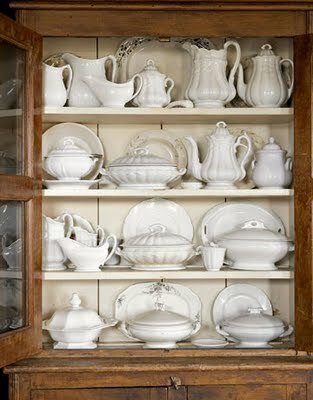 Hi Courtney, I love your white dish collection. I have a small collection but would love more. One problem, I am running out of cupboard space. I have them filled to the brim. I love seasonal dishes. The thing with white is that it is so versatile and I love mixing the patterns. Thanks for sharing all of these fun photos. 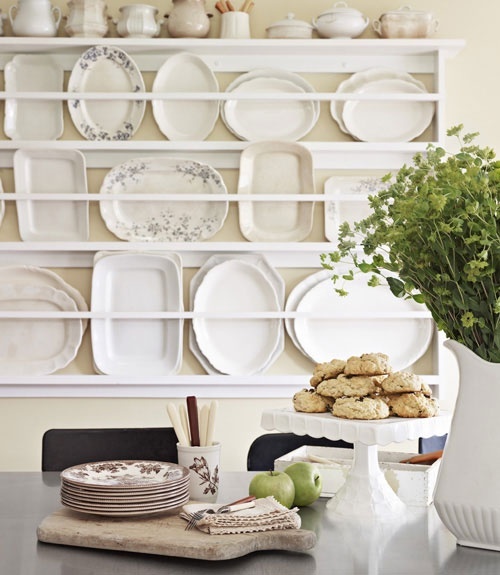 White dishes are so timeless, Your kitchen looks great. I just bought a white pitcher in London that I had to hand carry on the plane. Love ALL your photos. Doesn't food look pretty on a white dish? I saw your home in my favourite italian magazine, Casa Chic. Very compliments! It's beautiful, very beautiful! Trying to take it all in. SO gorgeous. Just when I think I have too much, I realize I have nothing and want to start all over! Ha! Pinning away from you blog! Que bonito post, me he paseado por tu bloc y me ha encantado, te invito a ver el mío, esta semana las mascotas son las protagonistas, nos hacen compañía y sacan lo mejor de nosotros mismos. Si eres un amantr de los anima les no te puedes perder este. Deseo que te guste y si es así y no eres seguidora espero que te hagas, gracias por visitarme.